President Donald Trump said afterwards that sanctions would remain in place for now, but would be lifted once “nukes are no longer a factor”. 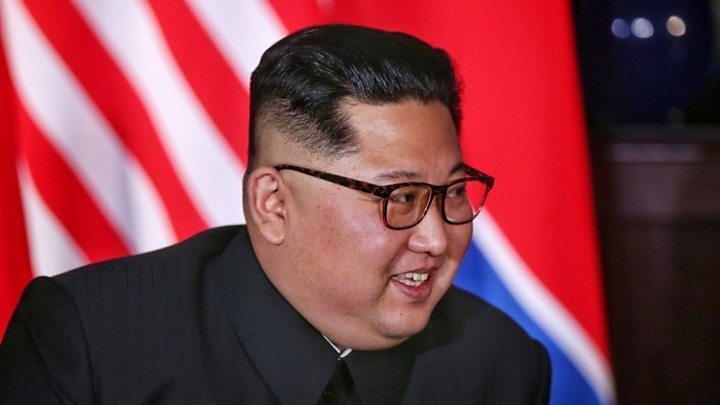 The move – long demanded by Pyongyang – has been seen as a major concession to North Korea and appeared to take US allies in the region by surprise. The Pentagon has since sought to reassure its allies of its “ironclad” security commitments. Media captionTrump Kim summit: Win-win, or a Kim win? In his latest tweets after arriving back in the United States, Mr Trump continued his upbeat tone. 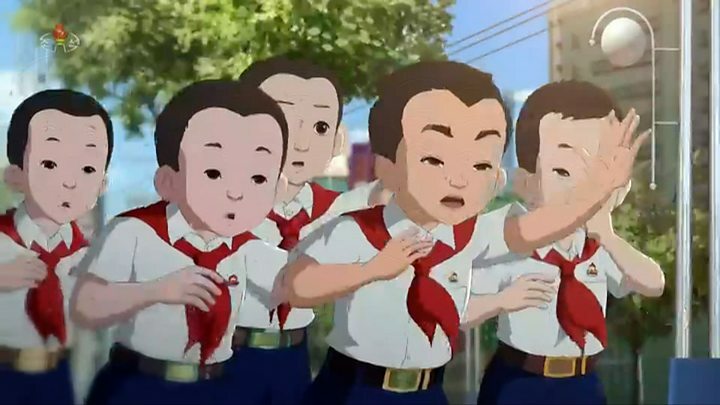 North Korea’s media are tightly controlled by the government and only ever report positively on officials’ activities. They rarely report on leader Kim Jong-un’s activities in real time. What are the US-South Korea war games? Did the summit rhetoric match reality? But Tuesday’s summit in Singapore was front page news on Wednesday, with multiple images of Mr Kim alongside Mr Trump. 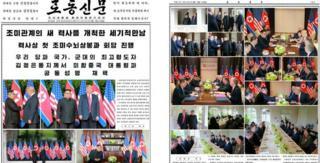 Official newspaper Rodong Sinmun called the summit “the meeting of the century” on its front page. State media agency KCNA published an enthusiastic article in English praising the talks as a historic break from the past. The declaration signed at the end of the summit said the two countries would co-operate towards “new relations”, while the US would provide “security guarantees” to North Korea. Pyongyang in return “commits to work toward complete denuclearisation of the Korean peninsula,” the document says. Most Western observers have said the deal appears to include significant concessions from the US while including no new commitments from North Korea nor details on how denuclearisation could be achieved. KCNA has focused on those elements as a great breakthrough for North Korea. “Trump expressed his intention to halt US-South Korea joint military exercises, offer security guarantees to the North and lift sanctions against it along with advance in improving the mutual relationship through dialogue and negotiation,” it said. Although not part of the joint declaration, Mr Trump said after the summit that sanctions “will come off” once the US is sure that the nukes are “no longer a factor”. He also said he hoped that this would be soon. Depicting the two leaders very much as equals at the meeting, KCNA quotes Mr Kim as saying it was urgent “to make bold decision on halting irritating and hostile military actions against each other”. KCNA also reported that both leaders had agreed to visit each other in the US and North Korea respectively. Japan’s Prime Minister Shinzo Abe spoke to Donald Trump after the summit, saying there was “great meaning in Chairman Kim’s clearly confirming to President Trump the complete denuclearisation”. Tokyo also, however, cautioned that despite Pyongyang’s pledge for denuclearisation no concrete steps had been taken and that Japan would not let down its guard. Defence Minister Itsunori Onodera said Japan sees “US-South Korean joint exercises and the US military presence in South Korea as vital to security in East Asia”. “It is up to the US and South Korea to decide about their joint exercises. We have no intention of changing our joint drills with the US,” he said. Chinese Foreign Minister Wang Yi described the Singapore summit as an “equal dialogue” between the two sides, adding that “no-one will doubt the unique and important role played by China: a role which will continue”. Chinese state media described the summit as a “starting point” but said “no-one would expect the half-day summit to be able to iron out all differences and remove deep-seated mistrust between the two long-time foes”.